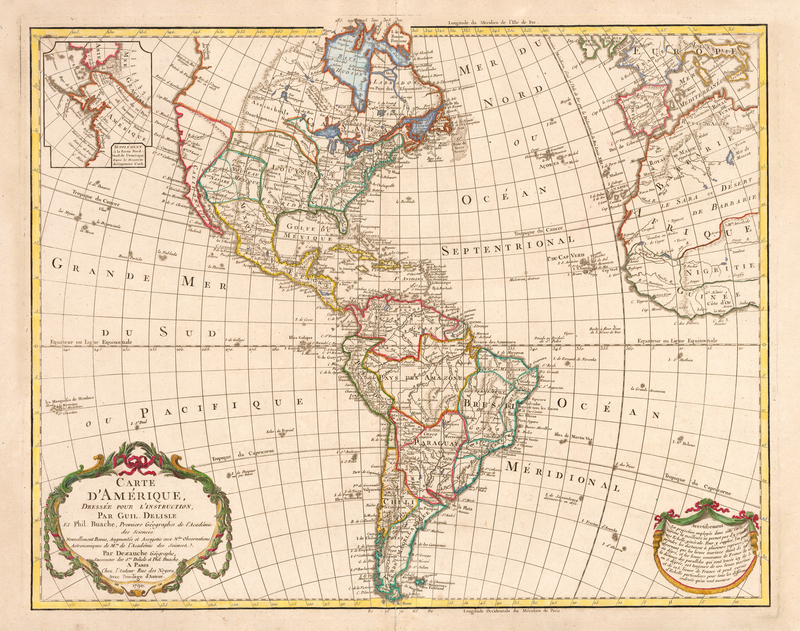 This is an extensively updated edition of Delisle’s 1720 map of the Americas produced by his successor Dezauche in 1790. This revised edition features an insert of the Alaska region based on information obtained from Captain Cook's discoveries. The recently independent United States is recognized controlling lands from the east coast to the Mississippi and as far south as Florida. Much of the west coast of North America is nearly void of any interior detail. In South America, the mythical Lac Xarayes still exists in Paraguay. Brazil is confined to the east coast as much of the interior is dominated by Pays des Amazones. The lower corners of the map are embellished with two decorative cartouches. The lower right cartouche describes the projection of the map while the larger title cartouche pays honor to Delisle, the Academy of Sciences, and gives privilege to d’Auteur (changed from du Roi). Due to the French Revolution, the Royal arms were erased from the cartouche and replaced by ribbons, and the king's name was removed from the title. Condition: Map is in A+ condition with light old coloring along the borders and full margins.